A man’s search for his on again, off again partner brought him to her mother’s door in the early hours of the morning. Connor Kay (21), who is fully committed on a separate petition case, appeared from custody at Falkirk Sheriff Court last Thursday having admitted behaving in a threatening manner in Argyll Avenue, Falkirk on January 21. 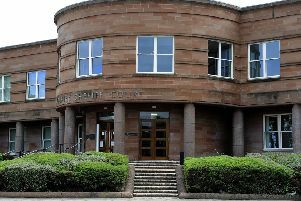 He also pled guilty to being concerned in the supply of £180 worth of class B drug cannabis in Striven Drive, Langlees and Woodhill Court, Grangemouth on May 20 last year. Procurator fiscal depute Graham McLachlan said: “It’s 4am and the complainer, who is the mother of the accused’s former partner, hears banging on the door trying to gain entry. She shouts down to him her daughter isn’t in. “He says he wants to use the phone so he can contact her. “She lets him in and he immediately goes up to the bedroom looking for his on/off partner before getting the phone and calling her number. Kay left, but returned later that same day to continuing his shouting, swearing and aggressive behaviour until police had to be called. Sheriff John Mundy sentenced Kay, 4 Bissett Court, Hallglen, to six months in prison.